See more objects with the tag interior, domestic, home, children, dogs, equestrian, carriages. See more objects with the color darkolivegreen gainsboro darkgrey darkslategrey dimgrey or see all the colors for this object. This is a Frieze. It was produced by Arthur Sanderson & Sons, Ltd.. It is dated 1905 and we acquired it in 1975. Its medium is block printed on ingrain paper. It is a part of the Wallcoverings department. This object was featured in our Object of the Day series in a post titled Children's Frieze Makes Learning Fun. It is credited Gift of Standard Coated Products. Printed in selvedge at end of each sheet: "Reg. no. 419363". 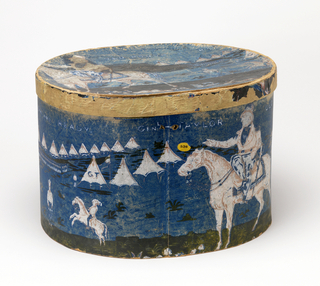 This object was previously on display as a part of the exhibition	Wall Stories: Children's Wallpapers and Books.